Windows 8 Pro, Windows 8 RT and Windows 8 Final Build has been released from Microsoft and many Windows users wants to experience the whole new look, design and interface of Microsoft's Windows 8 because Windows 8 is different from its previously released versions of Windows i.e. Windows XP, Windows Vista and Windows 7. Microsoft has made significantly changes in Windows 8 which makes it different and unique as compare to other Windows version. 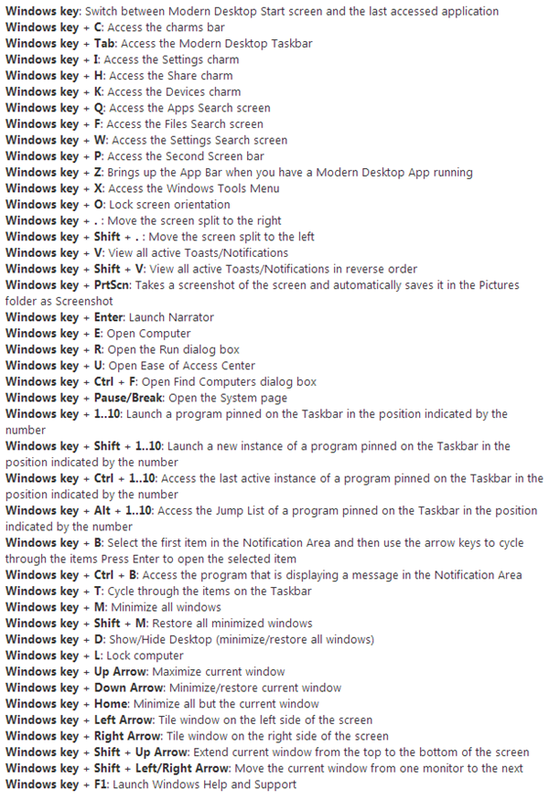 Many Windows XP, Windows Vista and Windows 7 users have already switched to the new version of Windows 8 and they are getting amazed with the whole new concept of Windows 8 with Metro UI Style and Metro UI Apps and also mostly users are not aware of How to use Windows 8 Keyboard Shortcut Keys in better way and most of Windows users are getting confused with the whole new function and features involved in Windows 8 concept and they are finding difficulty while working on Windows 8 version including Windows 8 Pro, Windows RT and simple Windows 8 version. So today in our article we will share List of Full Keyboard Shortcut Keys of Microsoft Windows 8, Windows 8 RT and Windows 8 Pro Operating System which will helps you in Windows 8 programs and also complete your daily work and tasks quickly, easily and faster. 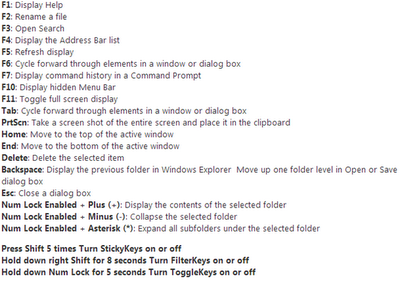 Windows 8 needs time from its users to get settle and working in user friendly atmosphere and we know that people will be familiar with it after some times but we understand and knows the problem which people are facing with Windows 8 so we are going to share some Useful and Working List of Full Keyboard Shortcut Keys available for Microsoft Windows 8, Windows 8 RT and Windows 8 Pro Operating System which helps users to complete their work fast, quickly and easily. 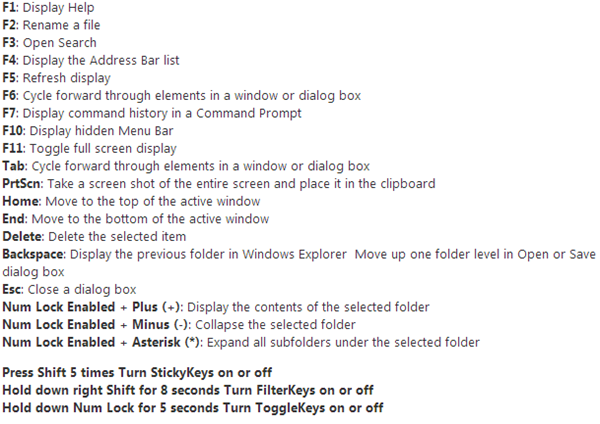 Keyboard Shortcut Keys of Windows 8 really makes it quick and fast because keyboard shortcut keys generally helps its users to be more productive and accurate while working on Windows programs. 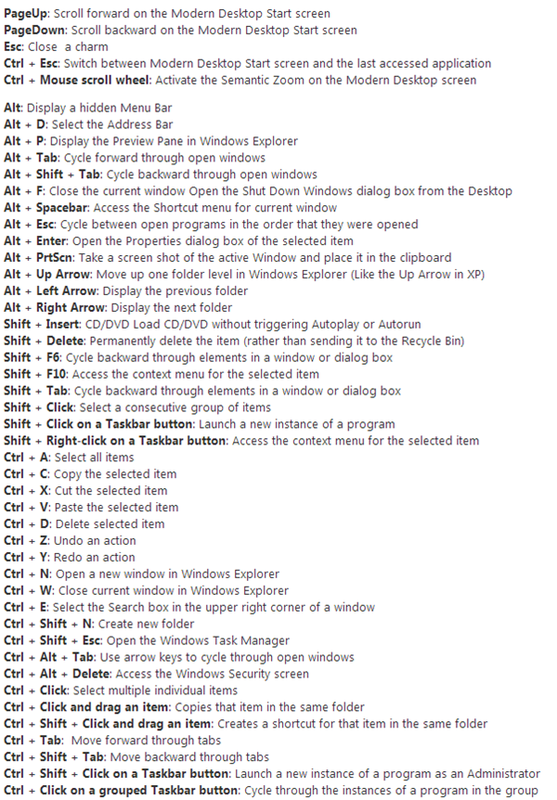 So we are going to share Full List of Updated Working Keyboard Shortcut Keys of Microsoft Windows 8, Windows 8 RT and Windows 8 Pro Operating System which will makes you more productive and accurate in your daily work tasks.